The Phoenix Stretch is a great exercise for low back pain due to tight low back muscles and hamstrings. A classic martial art exercise, the Phoenix Stretch promotes flexibility and correct body alignment. For generations, this simple exercise has been a component of many Nei Gong routines that preserve and promote health. In this article, NYIA Instructor Valerie Ghent details the Phoenix Stretch exercise and talks about her personal experience in treating back pain. Back pain. The very words make those who have experienced it wince and those who have not hope they never will. Last year, after getting a bad chill, I noticed a pain and stiffness in my lower back that I had never experienced before. It didn’t get better. I tried acupuncture, warming my back with Chinese herbal plasters, resting, eating more soups and warm foods throughout the winter, but the tight sensation and the pain continued. Then one day my lower back (the sacroiliac joint, or SI) seized up and I could barely lean over to put on my socks and shoes. My back happened to seize up the morning I was scheduled to teach a weekend class in Xing Yi Quan. In retrospect it might have been the best possible time it could have happened. Although limited in movement when we began, I used the deep breathing (Tu Na) and stretching during the class to try and gently open my back. After we finished I had another acupuncture treatment. At class the following day I was able to breathe into my low back and finally felt something open. I made it through the weekend but was distinctly aware of the pain in every movement. Although somewhat better after the class and the acupuncture treatments, the pain continued at a low level throughout the spring, some days better, some days worse. As I tried different ways of stretching my back out, one day an exercise we learned in our earliest classes suddenly popped into mind, called the “Phoenix Stretch”. It had been years since I last practiced this exercise, let alone made it part of my regular workout. That day I tried the Phoenix Stretch for about five minutes, breathing deep into my back. Afterwards I couldn’t believe the difference in how I felt! I resolved to begin my daily exercise with 5-10 minutes of the Phoenix Stretch. After just a few days of practicing this way I found my lower back relaxing and opening up, and the pain lessened, until after a few weeks, it was gone. 1) Start with the heels together and arms at your sides. 2) Clasp your hands lightly behind you, one hand gently holding the other wrist. 3) Simultaneously turn the right foot 45 degrees to the right and extend the left leg in front, placing the left heel on the ground with the toes pointing up (figs. 1 and 2). Make sure the body is erect and balanced. 4) Exhale and slowly bend forward from the waist, keeping the hips facing forward. Let the chest ‘drop’ towards the knee (figs. 3-5). 5) Hold the final position (fig. 6) for three breaths. Slowly inhale and exhale three times, using natural diaphragmatic breathing. Feel the breath fill the lower abdomen and lower back. Feel a widening in the lower back area. 6) Inhale and rise slowly (fig. 7). Use the right leg to lift you up, rather than the low back. 7) Continue to rise until you return to the start position (fig. 8). 8) Step the left leg back to right so the heels are touching. 9) Turn the left foot 45 degrees to the left and extend the right leg out in front, placing the heel on the ground with the toes pointing up. 10) Repeat Steps 5 and 6 on the right. 11) Repeat 2-5 times on each leg. Breathe slowly, deeply and continuously throughout the exercise. Do not force the stretch. Slowly increase the range of motion over time. Use the breath to increase the range of motion, relax the muscles and open up the back. Visualize that you are breathing into any area that is tight or restricted. Coordinate the breathing with the movement, exhaling as you lower the body, inhaling as you rise. Initially it may be difficult to do this exercise correctly. 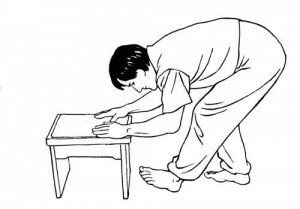 Using a stool or bench may help to control the body weight (see fig. 9). I heard the message loud and clear. Now I listen! And I practice the Phoenix Stretch.